A robot which was developed by researchers at the University to help children with autism to learn about social interaction has recently appeared in over 800 news articles nationally and internationally. 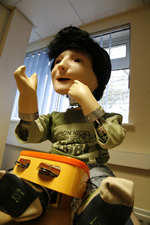 KASPAR the robot can be controlled and tailored to an individual child’s development needs. While obviously non-human, it has simple human features, minimal expressions and predictable movements. Do Men and Women Use Twitter Differently?